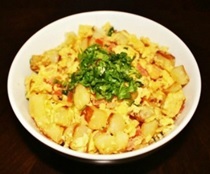 Spicy Scrambled Eggs are a quick, easy and a fabulous perfect breakfast dish. 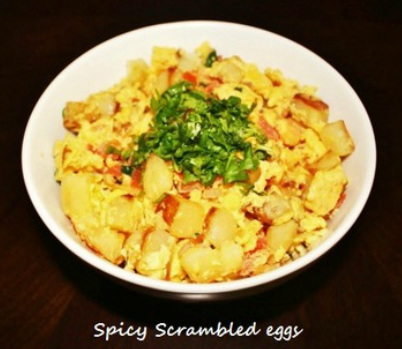 If you like spicy food even in the morning then the spicy scrambled eggs are for you. 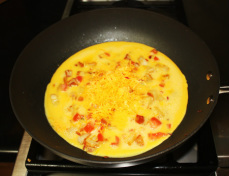 These eggs are scrambled with potato, onions, tomatoes, green chilies and to enhance the flavor cheddar cheese is added to it. You can serve this dish with crispy buttered toast for a flavorful breakfast. 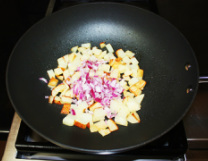 Eggs do not have to be limited to only eating at breakfast time, by adding vegetables, onions or anything you wish you can make a tasty, easy to prepare, healthy brunch. 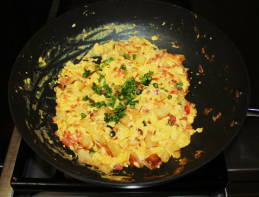 Spicy scrambled eggs are great for entertaining the guests for breakfast. Spice up your breakfast and enjoy. 1. 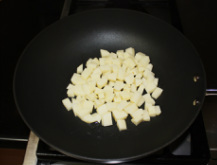 Heat oil or butter on medium heat in a nonstick frying pan, add chopped potatoes, sprinkle ½ teaspoon of salt, mix and cover the pan and cook on low heat for 12 to 15 minutes or until potatoes become tender and crispy. 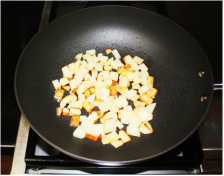 Do not add any water as potatoes cook in their own moisture. 2. 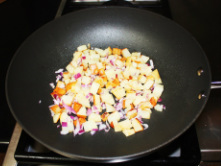 While potatoes are cooking, break the eggs and place in a bowl. Add ½ teaspoon of salt and whisk them well. Keep them aside. minutes or until they become soft and translucent. 4. 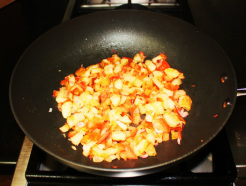 Now add chopped tomatoes, turn the heat to high and quickly heat the tomatoes for 1 to 2 minutes, while constantly stirring. 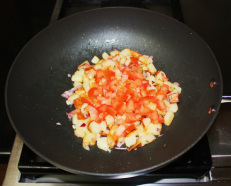 Do not cook the tomatoes for too long otherwise they become watery. 5. 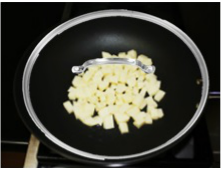 Turn the heat down to low, and pour the whisked eggs over the cooked potatoes sprinkle grated cheese and let the eggs cook undisturbed until they begin to set then stir them off the bottom of the pan gently and mix the Eggs with other ingredients. With the spatula scrape the sides and the bottom of the pan this will keeps the eggs from developing a leathery brown skin on the bottom and sides of the pan. 6. Eggs will quickly begin to solidify and cheese will start melting. Once eggs are cooked to the degree you prefer and cheese completely mix with the eggs, sprinkle half of green chilies and coriander leaves and mix. 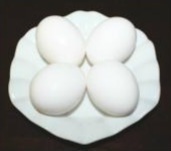 Turn the stove off and remove the pan from the stove because overheating will result in hard, rubbery eggs. coriander leaves and chopped green chilies. 8. Serve the scrambled eggs immediately.